Santa Barbara, CA – Be Green Packaging has received certification from Western Michigan University through their Old Corrugated Cardboard (OCC) Equivalency testing protocol. This certifies that Be Green’s packaging materials will recycle when put into cardboard recycling systems. The testing procedure involved testing 20% of Be Green’s fiber product laminated with PET with 80% old corrugated cardboard (OCC) and then comparing that against 100% OCC. As a Cradle-to-Cradle certified company, Be Green Packaging is committed to the entire life cycle of its fiber products. Be Green Packaging knows that its fiber life does not end after the consumer has finished using it. In light of this, Be Green designs and manufacturers our products so that they can in turn, be recycled into biological nutrients through home or commercial composting practices. Now we can certify that our bulrush fiber packaging with or without PET or rPET lamination, can also go into a paper recycle stream as a “technological nutrient”. Be Green Packaging believes in composting, however, composting has yet to become a mainstream practice. The composting collection systems in most communities are currently lagging behind the innovation of the compostable packaging industry. Meanwhile, the recycling industry is well developed and consumers are better educated as to the process and products that can be put into the recycling stream. Because of this, Be Green decided to submit their packaging to be tested at Western Michigan University’s Pilot Plant to confirm its recyclability. Be Green Packaging celebrates this confirmation that our food and industrial packaging materials cannot only be recycled into biological nutrients, but can also be used as technical nutrients in the recycling stream. More information on Be Green Packaging can be found at www.begreenpackaging.com. If you read Cradle-to-Cradle last month, don’t forget to send in answers to our quiz. You could win gift cards, T-shirts, books, and other fabulous prizes. Email all answers to Shala@begreenpackaging.com with subject title “Cradle to Cradle Quiz.” The quiz closes on Thursday, July 15th. Click here to download the quiz. Santa Barbara, CA – At Be Green Packaging, we believe the planet is full of eco-conscious individuals. These people likely drive their cars to work, produce garbage, and consume electricity and water. They may feel guilty each time they are at the pump or when they forget to turn the lights off, but it is unlikely that the average consumer will make disciplined lifestyle changes. Colin Beaven, on the other hand, decided that he wanted to change his ways. In 2006, he convinced his family to conduct a year long experiment to see if, in the twenty first century, it was possible for a family to make no net impact on the environment. “Beaven swore off plastic and toxins, turned off his electricity, went organic, became a bicycle nut and tried to save the planet from environmental catastrophe.” For one year, he lived a completely self-sufficient lifestyle. “In other words, no trash, no toxins in the water, no elevators, no subway, no products in packaging, no air-conditioning, no television” (www.borders.com). A few days ago, Be Green asked the question, “Could You Eliminate Plastic From Your Life?” No Impact Man shows that with some sacrifice, anything is possible. Beaven no only eliminated plastics from his life, but did so much more. Beaven documented his year-long experiment in his book No Impact Man: The Adventures of a Guilty Liberal Who Attempts to Save the Planet and the Discoveries He Makes About Himself and Our Way of Life in the Process. Beaven also created a blog to allow people who were inspired by his family’s effort, to follow suit. If, after reading the book or watching the film, you feel empowered to change your lifestyle, you can participate in the No Impact Experiment. This is a one-week long “carbon cleanse” that takes place in August. “It is a chance for you to see what a difference no impact living can have on your quality of life” (http://noimpactproject.org/experiment). In the 20th century, the American dream was to have two cars in every garage. Now, in the 21st century, perhaps this dream has become a bit antiquated. Why not have two bicycles in every garage and two feet on the ground as we move towards a healthier planet and a healthier population? Click here to download June’s Newsletter. 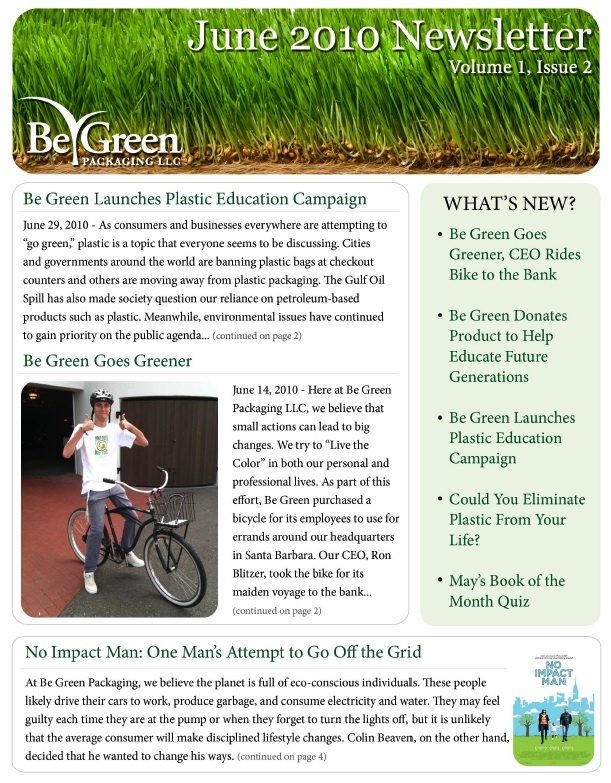 What happened in June at Be Green? Santa Barbara, CA – As a triple bottom line company, Be Green Packaging values and appreciates the communities in which they operate. Recently, the Boys and Girls Club of Santa Barbara celebrated “Green Week” with their students to help educate them on all things green. Be Green Packaging donated products to be used during their festivities and to help spur conversations about the benefits of composting. Be Green believes in the importance of educating the younger generations and hopes their contribution will have a long-lasting effect. Santa Barbara, CA – The words “green” and “sustainability” have emerged as common vernacular in business and consumer markets. Yet as companies and individuals attempt to ride the “Green Wave,” some are finding the waters to be more difficult to navigate than they imagined. That is why Be Green Packaging has chosen to feature Daniel Etsy and Andrew Winston’s Green to Gold: How Smart Companies Use Environmental Strategy to Innovate, Create Value, and Build Competitive Advantage. Green to Gold offers anyone interested in the “Green Wave” an opportunity to learn strategies and tips for creating value in a green market. The book takes readers through examples of companies that are “going green” and assesses the impact of their choices on, not only, their bottom line, but also their customers, suppliers and their reputation. The 2009-revised edition also contains a new preface outlining the forces driving green business, and includes discussions of green supply chains, hurdles, and environmental policies. It has been called “the definitive book on the greening of business” and, for this reason, is Be Green Packaging’s July Book of the Month.